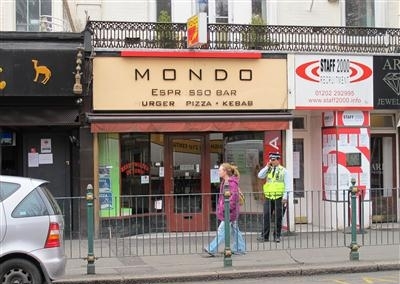 Bournemouth Borough Council: Pure Town Planning have just secured planning permission for a replacement shop front for the Mondo takeaway on Old Christchurch Road in Bournemouth. Old Christchurch Road in this location is a secondary town centre frontage comprising a long 3 ½ storey terrace with ground floor shop front units in a range of uses but predominated by food and drink with little A1 retail. The terrace is Victorian in origin and above the ground floor much original detailing remains present most notably the decorative first floor window surrounds. At ground floor level however there are no remaining Victorian shopfronts which have over the years been completely replaced by shopfronts in a variety of different forms, colours and materials. The site falls within the Old Christchurch Road Conservation Area. “It is considered that the installation of a new shop front resulting in the loss of the current recessed entrance and period shopfront would not preserve or enhance the character or appearance of the Old Christchurch Road Conservation area”. “Whilst I find that the principle of replacing the shop front with one in the manner proposed would be acceptable, the use of aluminium would be harmful to the character and appearance of the Old Christchurch Road Conservation Area”. So whilst the appeal was dismissed, it was a “good loss” as it provided a clear steer for what was acceptable. Off the back of this appeal decision Pure Town Planning simply reapplied to the Council showing exactly the same arrangement but with wood instead of aluminium frames and the application sailed through and was approved earlier this week within the 8 week time frame. Our client is very happy as the consent will replace the existing tired shop front with a simple modern shop front which will benefit the business by being more secure and easy to maintain to a high standard of appearance and will enable a rationalisation of the very limited internal space to improve the efficiency of the business. It is pleasing to be able to assist fellow local businesses negotiate their way through the complexities of the planning system. We know that often relatively modest changes such as this can make a huge difference to a business. If your business has a tricky little planning problem or perhaps a grand expansion plan why not call us today for a free no-obligation consultation.